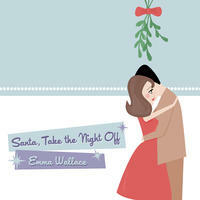 Emma Wallace : Santa Take the Night Off. Holiday songs to get you feeling warm and fuzzy with a cozy mix of songs from lilting traditional tunes to light and jazzy familiar favorites to gypsy-inspired originals. The title song, "Santa, Take the Night Off," is an original with inspiration from the classic Christmas songs of Nat King Cole or Ella Fitzgerald. Marie Bee returns to play her exquisite violin on three tracks, including the haunting "Noche de Paz" (Silent Night). From the hearty "Here We Come a-Wassailing" to the ethereal "Bitterest Winter Nights," and all the songs in between, Santa, Take the Night Off, will bring the warmest and sweetest parts of the holidays to you. License Angst-free modern ragtime by Emma Wallace for your project. Play the music of Emma Wallace in your restaurant or store.